16GB WiFi. Dazzling White. SAMSUNG GALAXY TAB S. MINT CONDITION. and I have these left over. PO Boxes or APO boxes. GrandPad 8" - Tablet - 32GB - Wi-Fi 4G LTE. Model Family GrandPad. Owner's manual. Color Black. Color Category Black. Smart case, stylus. Included Software. Stylus Included Yes. Galaxt Tab A 10.1 With S Pen Sm P580. Wifi ver, 16g. Condition is Used. No noticeable flaws. Works perfect. Include : samsumg book cover, box, charger, cord, extra tips for Spen, 32g micro SD card. I won’t do any transaction outside of ebay. Don’t ask my phone number, paypal account and address. I only ship to your ebay registered address. Don’t ask me to ship elsewhere Firm on the price. Please ask any questions before you buy. "[Tempered Glass] Samsung Galaxy Tab E 9.6 T560NU T560 Screen Protector, High Transparency, Tempered Glass, Glass Screen Protector for Samsung Galaxy Tab E 9.6(T560)". 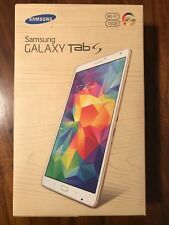 Samsung Galaxy Tab E SM-T560NU - 16GB, Wi-Fi, 9.6" - Android Tablet - Black. Lot of 2 units . THIS IS 2 FULL UNITS. Tested & Working . Used - Off Rental. Great condition and works great! Comes with generic sync cable - this is meant to be complementary and not your main cable. $1.99 Priority Mail Shipping!!. It has the latest Android security updates, and has been factory reset. Samsung Galaxy Tab E SM-T560 16GB, Wi-Fi, 9.6in - Great Condition!! 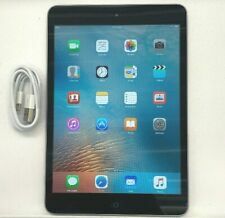 For sale is an Apple iPad mini 2 32GB WiFi with Retina Display. It is in mint condition and in excellent working condition as well. It was barely used and very well maintained. It comes complete in its original box with the charger and usb cable. The iPad comes with a ProGlass tempered glass screen protector that was installed since Day 1. I'm also including its original Apple Smart Case (full leather) in black color. 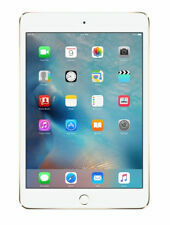 iPad will come with the latest version of iOS and factory reset for a new user. Thanks for looking! Fully Functional iPad 2nd Generation 16gb Wifi Only You Will Be Receiving: 1) 100% Fully Functional iPad 2nd Generation 16gb wifi ONLY 2) 3rd Party Charger Notes On This Specific Unit: 1) The unit you receive will show HEAVY signs of use including: scratching on the back, dings/dents/scuffs on the corners and scratches on the screen. 2) The unit has been fully tested with working battery and charger. 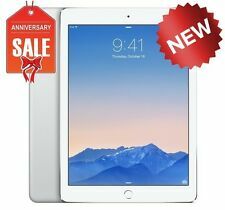 Specifications: Model: iPad 2nd Generation 16gb Wifi ONLY Product Condition: These iPad 2nd Generation will show signs of use. --- Screens work perfectly but will have light scratches. Corners will have dings and the back will have scratches. Please ask questions if you have any before purchasing. -iPad might show light dust spots under the screen (see pics). Samsung Galaxy Tab Pro SM-T320. The main display resolution is 1600 x 2560 pixels. Stay connected with this tablet’s Bluetooth, Wi-Fi, and USB connectivity. Product Information. 16GB internal storage plus microSD card slot: Plenty of space for music, movies, photos, and more. Open box, never used. Quad-core processor: The right combination of fast performance and power efficiency. Trending at $54.13eBay determines this price through a machine learned model of the product's sale prices within the last 90 days. 128GB iPad mini 4 wi-fi. In great shape everything works like it should. There is a hairline crack in the screen. It is covered by a plastic screen protector. No dings or dents in the iPad. No issues at all except the hairline crack. Tested and works 100% Shows signs of wear such as scratches as dings. Comes with generic sync cable, nothing else included. Discounted Priority Shipping.